Could Maz Kanata have commissioned Bazine to fetch the legacy lightsaber for her? That might have been the interesting story she wanted to tell Han. Not that Maz commissioned it. What bothers me is that Maz said she had it for some time and I took it as a very long time. I am still convinced that Kylo had the lightsaber at some point and Maz took it from him. So did the ex-stormtrooper have it before or after Kylo and why did no one in the med center take it from him? The lack of clear timeline is annoying. In the EU, there is this awesome story of where the lightsaber goes after Bespin and it ends with Ben Skywalker claiming it back to prevent a Snoke like character from claiming it.....I hope that happens in episode 9. That story with Ben Skywalker was interesting but it was non-canon in the EU timeline. I know..... But it would be funny and quirky if what was non-canon in EU becomes canon. Anyway, I only posted the page because that is a scenario I would really like to see. Well Darth Maul coming back in TCW was inspired by that non-canon EU story where he returned and tried to kill an infant Luke on Tattooine in order to draw out Obi-Wan and Obi-Wan had to defend Luke from him. I mean even the designs of the metal legs are the same! So if that can happen, who's to say this can't. 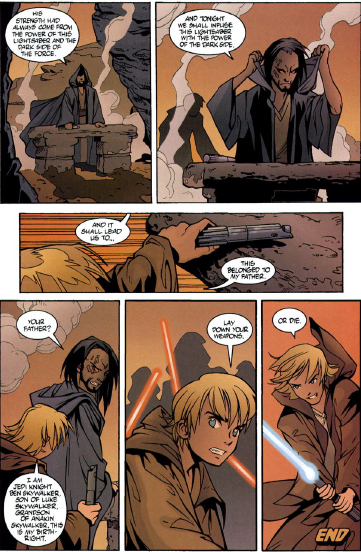 It would certainly be a awesome scenario to adapt into the new canon. @panki One never knows! It certainly would be a perfect way to set up a final confrontation between Obi-Wan and Maul. The question is how would Maul be able to find him without them giving away their location (and also the question of Maul being able to find him where Vader and Palpatine couldn't). The only way I can think up so far is that he finds out through Bo-Katan but she manages to warn Obi in time so he is ready and waiting....and finally dispatches Maul. Nooooo! Maul cannot die. He is immortal. Jk I'm actually really worried Maul might die in this next season. I'm just in denial. Hang on, you've been discussing The Perfect Weapon here without me and @SanghaRen even tagged me but I didn't see! Bah. @Darth Dingbat wrote: Hang on, you've been discussing The Perfect Weapon here without me and @SanghaRen even tagged me but I didn't see! Bah. Ooooh...... I just read about this upcoming series yesterday..... the rumor is that the comics are about the adventures of Doctor Aphra.....but what if it is actually Bazine Netal who is getting her own comic series? SW: Classified is a placeholder title but if it gives us a clue as to the theme of the comic, I would say we're either seeing a series about bounty hunters, law enforcement, level 1313, assassins, Hutts etc. Also, have you read about the upcoming Yoda story in Star Wars #26? It is another entry from the diary of Ben Kenobi and is supposed to be quite interesting. The Poe Dameron comic series was supposed to only have 8 issues..... this was only recently inserted and the original issue #7 has been postponed to November and this new story has 40 pages instead of the normal 32..... this has to be a calculated decision. I am going to say its a safe bet that Poe is meant to cater to the traditional male audience who want a conventional hero (a lot of whom buy the comics)...while Kylo is the hero catering to the growing female audience and new markets (so therefore important in the movies). Due to her popularity, a new comic series has been announced which charts Doctor Aphra's adventures around with galaxy with her two murderous droids and wookie bounty hunter in tow.....we're going to learn more about the history of the galaxy and get more Old Republic related clues. May the Books Be WIth You: Enter to win a copy of Carrie Fisher's new memoir The Princess Diarist, and Claudia Gray's novel Bloodline. Sweepstakes runs 22 November through 6 December. So I read the first two Aphra comics. I think I complained about this before, but why are comics in general so short? In 10 minutes, it's gone. 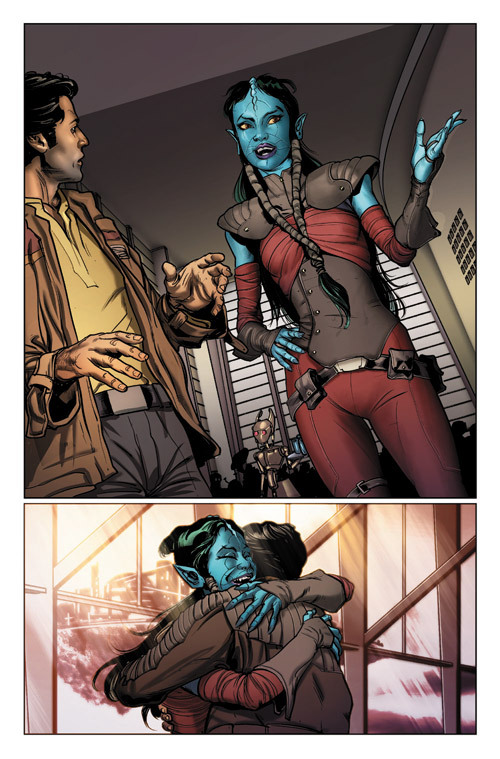 One thing that bugs me in the Aphra comics specifically is how it jumps from one emotion to another for a character. I wish they would include intermediate drawings. 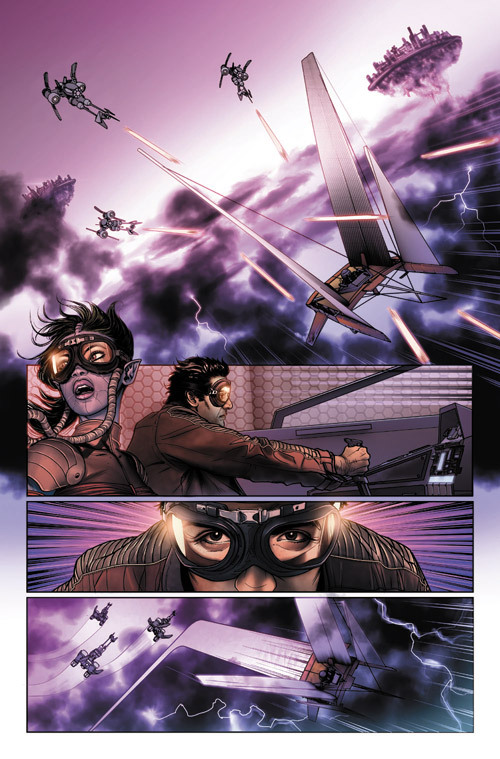 Here you really go from pissed off Aphra to resigned Aphra. Comics are not books, but still they could linger a bit more. My opinion. I do like the characters. And the story is intriguing. I see which character could be Snoke. Not sure LF will go this way, but it could fit and make for an interesting story. 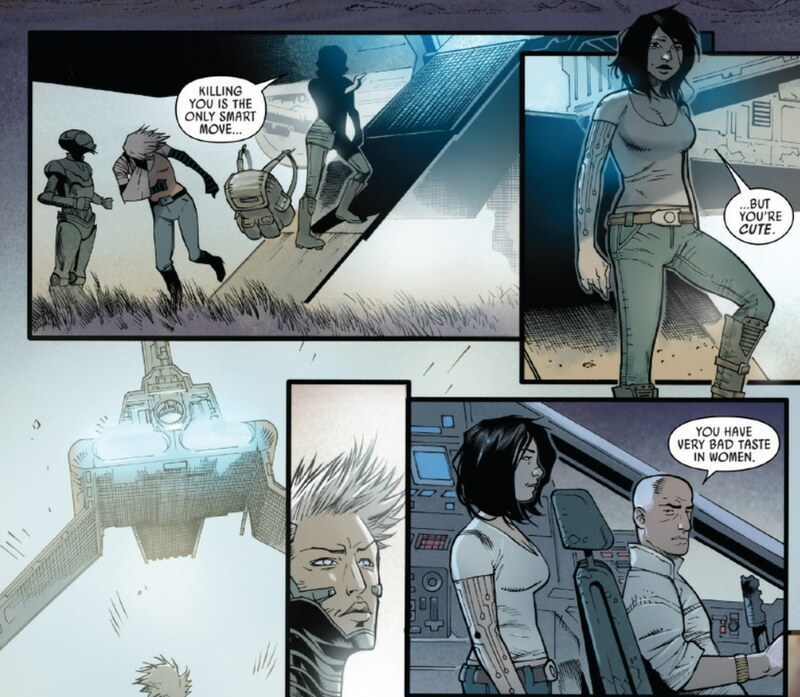 Rey being a scavenger and Aphra being an archeologist could provide nice parallels. The two sides of the story could be what Snoke served to Ben and what Luke (and the Jedi) thinks on the other side. Let's see what happens next. Question: is the droid pairing typical in the SW universe? The 2 really look like the darker versions of if C-3PO and R2-D2. And then you have the dark version of Chewie. I agree with you regarding the length of the comics....they throw something interesting into the mix and before you can really absorb the story....its over and you're left wanting to read more...sigh. I've noticed that ever 3-4 comics normally completes a story arc....I would have settled for two comics doing the same even if they felt one comic would be too short to tell the story. Did you see the image Aphra was burning? It looks like her father worships some Goddess.....this is the second time I am seeing a Goddess appear in canon- the first is the Goddess Ri'ia worshiped on Jakku by the locals. I wonder if Aphra's Dad has some link to Jakku. is Snoke (this story might not even be connected to Snoke), I like the idea of Luke and Snoke giving Ben two versions of the same story.....Another thing that got my interest was the kybers and the padawans especially since RO is all about powering up kybers and the ST has a story of dead padawans and a burnt jedi temple too.... one of the junior novels "Servants of the Empire" mentions the same jedi group in passing- they say that pirates kidnapped pilgrims and handed them over to this group.....the whole thing sounds very creepy. The droid friends pairing is a good observation....I think it is a bit of a trend across movies and TV shows to have one short droid and one tall humanoid one. 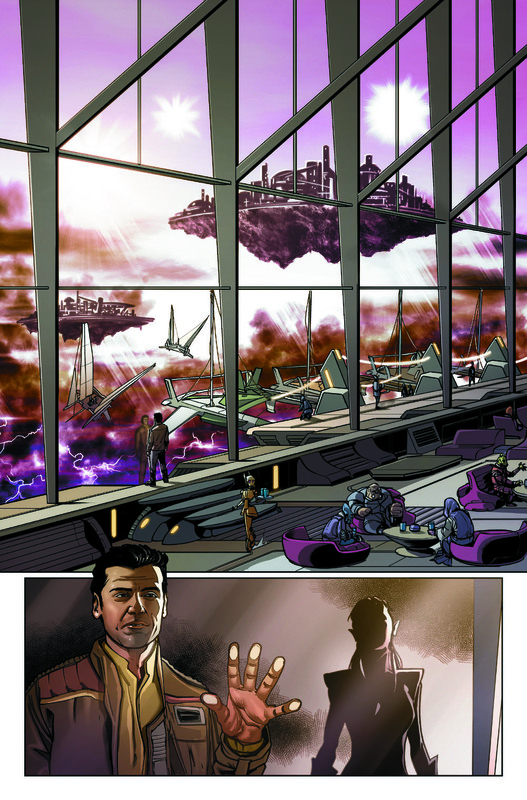 And now we have 0-0-0 and BT-1 who first appear in the Vader comics and belong to Aphra....this makes me think we might see a new humanoid droid in episode 8 to give BB-8 company. Black Krrisantan (the dark wookie) and Chewie are aenemies.....they have this major confrontation in the SW comics and I think he might be responsible for some bad events on Kashyyk... he even had a big fight with Obi-wan in the past and had to leave Tatooine wounded......even though he hangs around with Aphra because she owes him money, I think he is fond of her in his own way. I feel like Aphra is a mix of Rey and Han Solo, but a dark version....with her droids and her wookie. 1. The resistance (mainly C3PO) has recruited many droids to work undercover on various planets, and some of them have attitudes reminiscent of K2SO. This connects to that droid who tells the resistance that BB-8 is on Takodana in episode 7. 2. The FO has former imperials who have no loyalty to the FO command, and have their own gangs and agendas.....Agent Terex calls Kylo Ren a freak....reminiscent of how imperial officers perceived Vader. 3. Kyber crystals were being transported by the FO (hiding their uniforms and acting as regular spacers) even as early as 27 years before the events of TFA. 4. Tarkin's ship The Carrion Spike has some of the best cloaking devices, allowing it to sneak up on other vessels. I will put that here because I don't know where else to put it. I am still trying to crochet a twi'lek hat. Got a pattern and I nearly finished one but I don't like it so I will undo it and try again in another color and slightly different. I will probably never wear it so I don't even know why I want to crochet one. I guess if I am jobless one day, I can crochet hats and sell them. how they went from the moon temple to the city in the last page. Apparently her father got the coordinates through the device he was using - that got them discovered by the Imperials - when the different buildings (or are these all temples?) lit up. But how did the different buildings lit up? Why? And what was he measuring? I am frustrated that they don't explain things more. Maybe there are answers in other books, but I don't want to buy other books. I want to have a story that can stand on its own in this series. I am a bit disappointed. As I said, I like the character and will buy the next isssues, but they could have done much better. The one thing that did get my attention was the strange lightsabers near the dead jedi...maybe the jedi we saw in the PT are not the same as the jedi of old...and they seem a bit taller than regular humans as well. 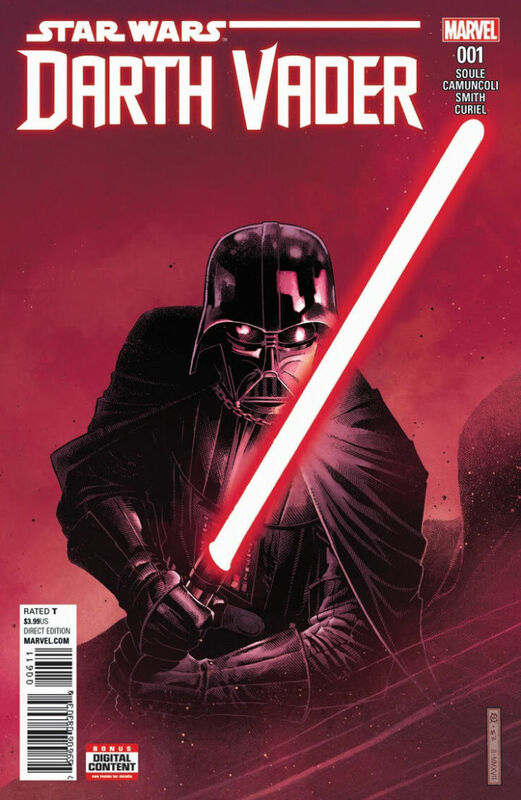 Marvel is releasing a new Darth Vader comic series, starting from this June, and we'll get more details about it during SWC.... the stories are set just after the ROTS, starting from the moment Vader joins Palpatine as he is viewing the DS being built. The comic is supposed to be on the lines of the Batman: Year One comic series, where batman starts as a rookie vigilante and develops into the Dark Knight....so Vader is still getting used to life in a suit, life without Padme, his new role as a sith lord, as well as exploring the dark side of the force without the need to hide it from the jedi etc. “The book begins one second after the end of Revenge of the Sith. Darth Vader is in the armored suit that we see throughout the rest of his life, most of his life," Soule explained. "He is just awakening to that moment and that realization. So he has shouted ‘No!’ in the way we see in the film, and then it picks up immediately after that point. So we see him adjusting to that. We see him learning to be more machine than man. We see him going through some really, really cool early moments of his early mythology and history." Its official.... SW comics has its first LGBT lead- Doctor Aphra.....though its still not clear if she likes both men and women, or just the ladies..... I'm sure either option will be well received by the comic book fans (Han Solo's ex Sana is bi but she isn't a lead character). Its unlikely they'll make Poe an LGBT character now since he and Maul are the only characters other than Aphra with ongoing comic book series in their names right now. For those of you interested in general about the behind-the-scenes history of Lucasfilm and some of the films, former LF writer JW Rinzler (who was slated to write the Behind the Scenes of TFA book before it got cancelled and he was laid off right after TFA's release) has been blogging about his time with the company. @snufkin wrote: For those of you interested in general about the behind-the-scenes history of Lucasfilm and some of the films, former LF writer JW Rinzler (who was slated to write the Behind the Scenes of TFA book before it got cancelled and he was laid off right after TFA's release) has been blogging about his time with the company. The Phantom Menace had just come out and I’d really liked it, as had my older daughter, who was about 11 at the time. And, believe me, I don’t say I liked Episode I lightly, because I know that people whom I respect find this baffling. However, I find their inability to see past a few flaws to the greater achievements of Episode I to be equally baffling. My daughter and I attended a preview of the movie in SF, so in that brief moment before the backlash and after, none of the government or trade blockade material bothered me; in fact I found it interesting—true, Jar Jar and some of the jokes were not to my taste, but neither had the Ewoks been a rousing success—and it was great enough to see Jedi in their prime (though, clearly, representing a flawed Order, which was also intriguing); Liam Neeson was good; Darth Maul was a fantastic villain; the art direction was beautiful (it would’ve been redundant to see the same universe as before, given that it’s a different galactic time period); and the Podrace—a showstopper—was a symphony in sound design, like the speeder-bike chase in Jedi. I was ready for the sequel—and I wanted to be there, involved. Also, all the feels when he mentions how he got the job on 9/11/2001. @cowgirlsamurai - Glad you're enjoying it! I thought the parts about both his dad's involvement with Rolling Stone in its early San Francisco days (which is why I'll never stop eyerolling over Vanity Fair claiming that it's the big deal for Star Wars cover stories) and the company history of Lucasfilm make his perspective especially valueable. The bits about LF also interest me because I have several friends who've spent a good part of their professional lives working for another iconic company which came out of this region, Tower Records. It's all part of the larger history of the businesses that came out of the 1960s here. Thanks for sharing this! I'll have to catch up with these when I'm not on vacation and can really sit down and read through them. Already marked it as favorite.